I saw this card posted on another demonstrator's website (stampwithtami.com) and I had to share it. 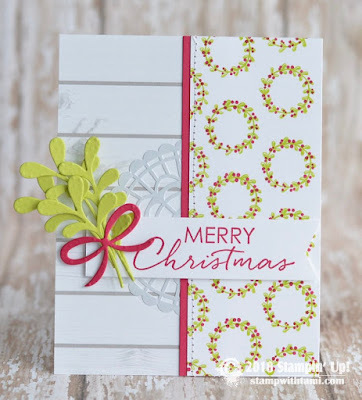 I absolutely love how this card uses the new Alpine Adventures stamp set, paired with the I'll Be Home stamp set. The greenery and bow are from the Pretty Pines thinlits. Festive Farmhouse DSP lends the wood grain panel and the new pearlized doily adds a feminine touch. Tami gives credit to Veronica for the design, and so I will do the same. Veronica, this card is stunning...thanks for sharing. I would love to see your holiday card creations. Share them in the comments below, or hop on over to my Facebook page and join in the conversation.